I'm a huge fan of a J-pop band the Field of View (tFOV). The band itself has disbanded, but I'm still a fan.. I'm sure many out there still have the same passion as mine. I have a fansite, which I built in 2002, dedicated to tFOV. As not many news I can gather after their disband, that simple old website is neglected. Now that I have a blog, I'd like to make a page linked to that site. 09.1994: with the label view, Takashi Oda (guitar), U-ya Asaoka (vocal), Jun Abe (keyboard), and Takuto Kohashi (drums), banded and released Ano toki no naka de bokura wa. 05.1995: a debut single Kimi ga itakara under the flag FIELD OF VIEW. 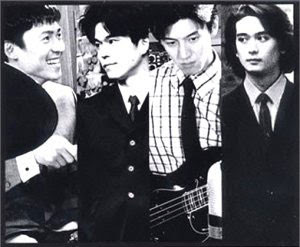 03.1996: 4th single DANDAN Kokoro Hikareteku released with only 3 of member, after the leaving of Abe. 05.1996: 5th single DOKI, first single for the new member Kenji Niitsu (bass). 05.2001: As the 18th single released, the name was changed into the FIELD OF VIEW. 07.2002: tFOV declared their separation, with the 20th single Melody as the last melody of theirs. 11.2002: the last live show held in Osaka and Tokyo. - ART BOOK some little fanart I made.. yeah, another laugh..